Gloria Goodwood, the presenter of Superpets, is always coming up with ideas to keep her show's rankings high. The latest idea is Animalympics, for which specially selected animals take part - and sure enough, the country with the most medals wins. Great excitement, but what will Stunt Bunny do? She is 'allocated' a sport, and goes into strict training. But competition is fiercer than she thinks – certain other countries have exceedingly talented athletes too. Harriet's (OK, Stunt Bunny's) chief rival is a more than aggressive kangaroo rejoicing in the name of Krusher... but that isn't the only difficulty en route, because Harriet's old nemesis, the Great Maldini, makes a reappearance. Will Harriet win the day? Or will it be a case of run, rabbit, run, rabbit, run, run, run... 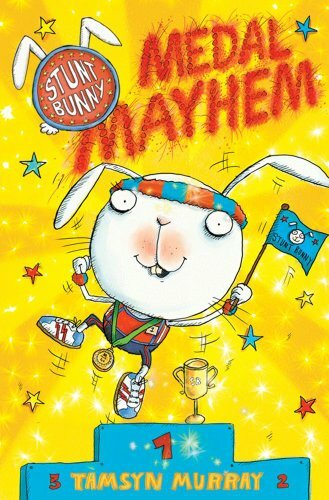 Fans of the series will enjoy this sequel, and those new to Stunt Bunny and her world will enjoy getting to know her and all the surrounding mayhem.